Your Majesty, Your Royal Highness, Tánaiste, Secretary of State, First and Deputy First Ministers, Your Excellencies, Ministers of State, Leaders of Opposition Parties, My Lords, Ladies and Gentleman. As Chairman of Co-operation Ireland, I am both delighted and honoured to welcome you all here tonight. First of all, I would like to convey to you, the contents of a letter I have received from The Prime Minister, Rt Hon Theresa May MP, who would have been with us tonight, but for her commitment to a trade visit to India. I am delighted to send best wishes for a successful evening as you gather to celebrate both the work of Co-Operation Ireland and the strength of the relationship the United Kingdom and Ireland. There is no doubt that relations between our two countries are at their best since Irish independence nearly a century ago. We are bound together by ties of history, family, business, trade, culture and identity. This year has also shown how sensitive anniversaries and events that once had the potential to divide us can be handled in ways that are inclusive, respectful and are designed to promote shared understanding. I am determined that as the United Kingdom forges a new role in the world the bonds that unite our two countries are both strengthened and deepened. Co-operation Ireland has played a key role in fostering the relationship between the UK and Ireland as well as promoting reconciliation on the island of Ireland and building a stronger, shared society within Northern Ireland. You promote, manage and implement a whole range of imaginative programmes that bring together young people from all parts of the community with the aim of building a more peaceful, stable and prosperous Northern Ireland for everyone. It is fitting that your event this evening is held in the presence of Her Majesty the Queen and HRH The Duke of Edinburgh. 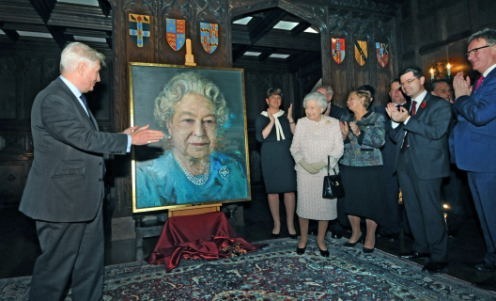 As everybody agrees Her Majesty’s historic visit to Ireland in 2011 and the return visit by President Higgins in 2014 were ground breaking events. They helped to take UK-Irish relations to new levels and of course Co-Operation Ireland was involved in both of them. I am really sorry that commitments elsewhere prevent me from attending this evening. I am sure it will be a huge success, and I send you every good wish for the future. I have seen in my time as Chairman of Co-operation Ireland, vast improvements in Anglo-Irish relations, and North / South co-operation for mutual benefit. I remember very well in 2005, Your Majesty, that you sat in this very room with President Mary McAleese and had, for the first time, a private meeting together. Following on from that, your historic state visit took place in 2011 after policing and justice had been successfully devolved in Northern Ireland. That state visit, Your Majesty, transformed Anglo-Irish relations. Your historic speech in Dublin Castle, I know moved all of those present, and cannot fail to have moved all of those who had been affected by the turbulent history between the United Kingdom and Ireland. Your words quote; “With the benefit of historical hindsight we can all see things which we would wish had been done differently or not at all” unquote, resonated across nations and humanity. In 2012, hosted by Co-operation Ireland at The Lyric Theatre, Belfast, you symbolically took part in the hand shake with The Deputy First Minister, Martin McGuinness, who is with us here tonight. In 2014, in the return state visit of President Michael D. Higgins to Great Britain, you hosted, Your Majesty, a great Irish Reception and a separate great State Dinner at Windsor Castle. You very carefully, Your Majesty, ensured that these were totally inclusive events that nobody was left out whatever the differences, everybody was coming together. Though Your Majesty wasn’t present, the final night’s supper of that state visit took place here in Crosby Hall after the Irish Governments Concert at The Royal Albert Hall. We were still eating our main course at 1am. Once again, with all the concerned Government Ministers and officials present, many of whom are here tonight, the warmth of the relationships stimulated by that state visit were evident to all. None of this, Your Majesty, could have happened without your grace and leadership. Tonight as we attend here in November 2016, a year with its symbolic centenary, and with the problems that will need to be resolved as a result of the Brexit referendum, I have great hope that the warmth of relationships will bode very well for the future, and will be seen, Your Majesty, as one of the great achievements of your long and glorious reign. We at Co-operation Ireland will do our best to facilitate the smooth path of these relationships in very much the spirit of what you, your Majesty, have set for us all. I wish to congratulate the British and Irish Governments, and the devolved administration of Northern Ireland on the way the centenaries of the 1916 Easter Rising and the Battle of the Somme were handled with such sensitivity and diplomacy. Until recently both were mainly seen through the prism of green or orange tinted glasses. Understanding and meaning got lost as each tradition on the island of Ireland created their own myths and myopic view of either event. The ideals of those in the Rising to unite green and orange got lost in the maze of history and the sacrifice made at the Somme by men of the 36th Ulster and the 16th Irish divisions faded from collective memory. It is to the future that Co-operation Ireland looks as it seeks to perform its role in Anglo-Irish and North / South relations. Co-operation Ireland is uniquely established between the United Kingdom and Ireland with both heads of state at its helm. I am valuably assisted on the Board by my Deputy Chairman, former Taoiseach, John Bruton, the former First Minister, Rt. Hon. Peter Robinson, the former Permanent Secretary to Northern Ireland, Sir Jonathan Phillips, the former Ambassador to London, Daithi O’Ceallaigh, and former special envoy to Northern Ireland, Ambassador Paula Dobriansky, amongst many others, some of whom are here tonight. A special mention must go to my Chief Executive, former assistant Chief Constable, Peter Sheridan for his devotion to our aims and objectives which I know are heartfelt. Co-operation Ireland never seeks to be prescriptive, but seeks to help the dialogue moving forward with its unique neutrality and in depth knowledge of political life and government institutions, supported by its extensive work across the communities on the island of Ireland. I can assure you that Board meetings of Co-operation Ireland with the representatives of all of its stakeholders, the British government, the Irish government, the devolved administration in Northern Ireland, and the American government are extremely constructive. I would like to thank all of the Ministers and Political Leaders for giving of their time and coming tonight. I would like to thank all of Co-operation Ireland’s supporters and associates, many of whom have come from the island of Ireland to be here. And I would like to thank RTE, who have both historically and tonight given such helpful consideration to Anglo-Irish and North / South relations. In Crosby Hall, I am mindful of its previous occupant, Sir Thomas More and the gatherings that he would have hosted. I am very pleased that tonight, this Great Hall is able to host another such memorable and symbolic gathering. As part of the hand-shake with the Deputy First Minister, Martin McGuinness at the Lyric Theatre, Your Majesty, you saw an exhibition of Colin Davidson’s internationally acclaimed work. Your Majesty, you graciously agreed to sit for Colin this year, and Colin has painted the portrait that you are about to unveil. Colin has generously donated this portrait to the eternal ownership of Co-operation Ireland. 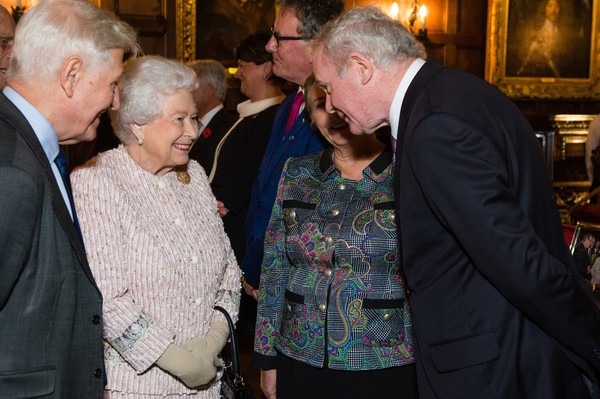 Your Majesty, you have been joint patron of Co-operation Ireland for 21 years, and have had such a huge impact on its operations and developments. Co-operation Ireland will greatly treasure your portrait. However, Co-operation Ireland will be sending this portrait out on loan to galleries in Belfast, Dublin and further afield, and in between times, it will have a home on the walls of Crosby Hall. 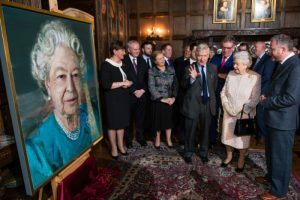 Your Majesty, thank you so much for all you have done for Anglo-Irish relations and for Co-operation Ireland, and I would now like to invite you to unveil your portrait.